These books were made from card weight paper -- Canson MiTeintes and an unidentified card stock). They are concertina books with wrapped covers. Inside each book are pieces of my handmade paper (cotton with inclusion, iris or flax) and each book contains rubber-stamped miniatures of either insects or flowers, with the name of the pictured object written below. 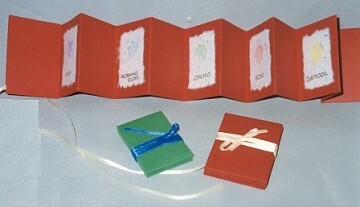 Book 2¾" x 2" (7cm x 5cm).